For my nephew's birthday I made him this card. I loved all the banner flags in this paper and made the tags as accents. I think it turned out fun for a boy who rocks. Front sentiment: You rock! Nephew. Happy Birthday. Inside sentiment: Big strong hugs! Also: BasicGrey What's Up paper, cardstock, Ranger jet black archival ink, Tim Holtz distress markers in barn door, pine needles and bundled sage, punches and Pop Dots. I put together for today this light bulb themed design for a Father's Day card. Once finished, it really is fitting for birthdays and other occasions, I think. This design was inspired by Miss Leanne's sketch challenge over at My Creative Time this month. It will be included there, since it is filled with elements made with their wonderful products. 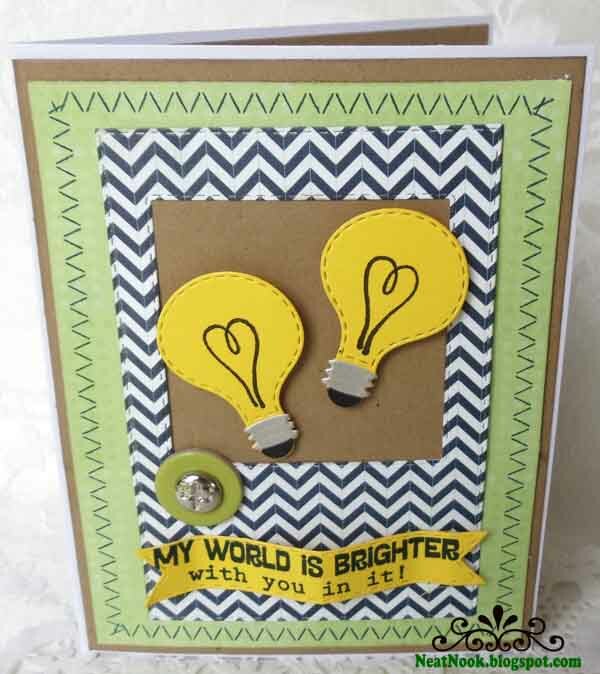 Front Sentiment: My world is brighter with you in it! These light bulbs were framed in navy blue chevron against kraft and lime green cardstock. These light bulbs were crafted from a new MCT die set. These are super fun to work with. The brad includes embellishment hardware in complementing colors. For me, it is a challenge not to include a bow, ribbon or a flower. 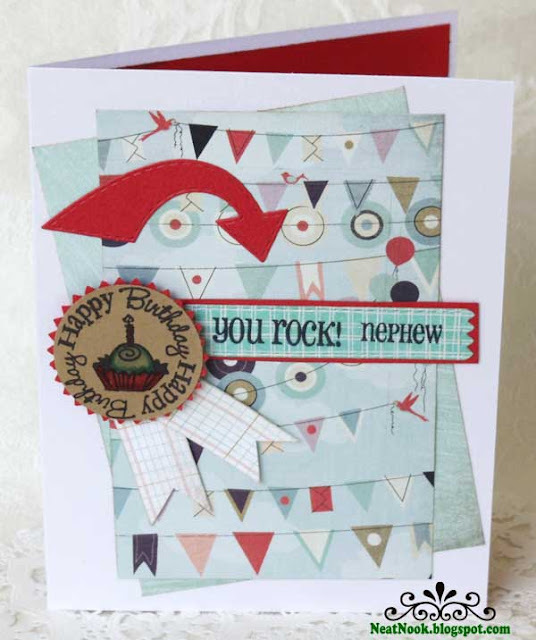 From My Creative Time: My Favorite Sayings stamp, Stitched Capture Frame Die, You're Brilliant stamps and dies, Vintage Stitched Label Dies. Also, cardstock and paper, Ranger archival ink in jet black and cobalt, brad, Technique Tuesday, BasicGrey paper and Pop Dots. 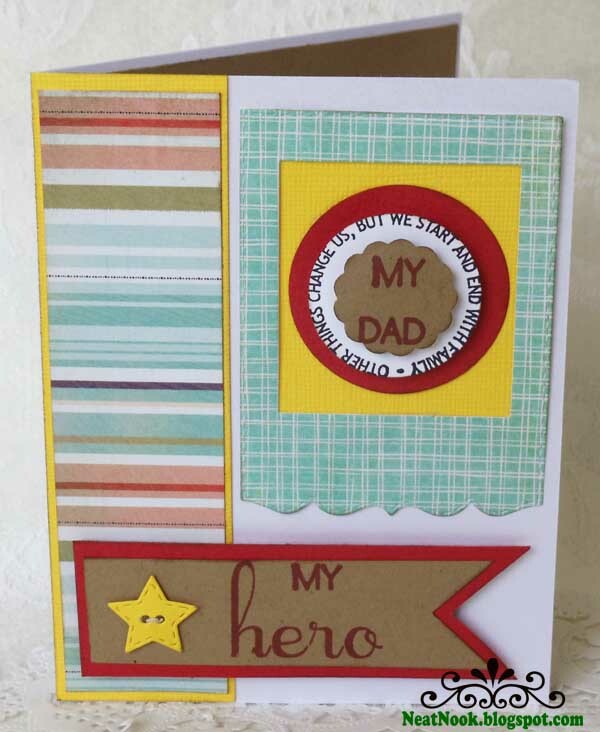 Here is another masculine card design for Father's Day. This will be included in the Unity Stamp Company June/July 2013 Color Challenge and the Friends With Flair projects today. I have a little giveaway today also. I love these colors together, inspired by the picture below. They work so well with what I had in mind for this design. From Unity Stamp Company: Unity In America, FORE!, Heartfelt Sentiments & Birdie Inspiration. Also, My Creative Time dies.